Lately I’ve been working on LHN’s Seasons Greetings when I have both the time and energy to stitch, which has been far too seldom recently. And while working, my mind is greatly occupied by the what-to-stitch-next conundrum. I’ve rooted through the main stash as well as the readily-to-hand stash (this is a real and very intentional distinction). 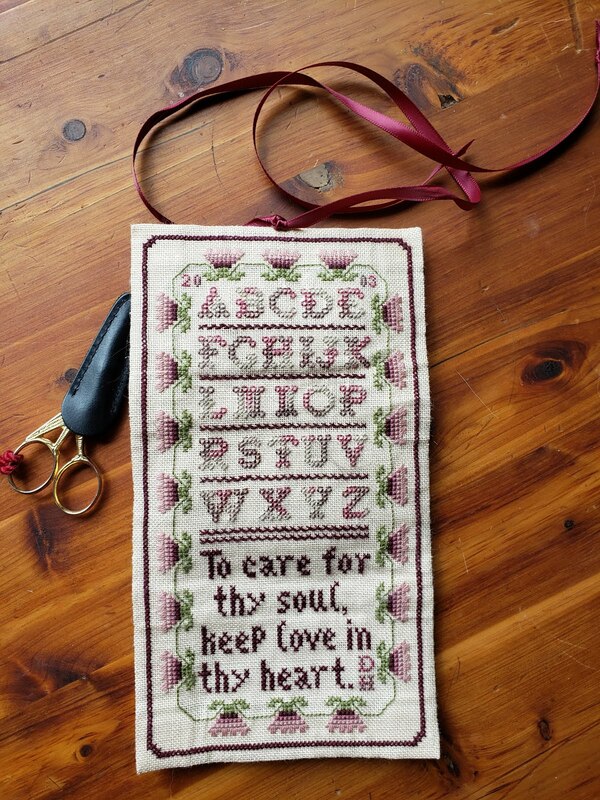 Of course I want to stitch it ALL, and fondling perusing all the pretties makes me want to stitch it all RIGHT NOW!! There are … I suppose I could whittle it down to four. There are four things I want to start. Two are samplers Wonderful Husband gifted me with, one is a full-coverage piece (also a gift from WH), and the last is another sewing case. Oh, better make that FIVE. I have succeeded in acquiring the chart for Goat Load from Plum Street Samplers and want to stitch it over one as a Christmas ornament since goats are the subject of a longstanding joke between Wonderful Husband and myself. But how do I decide??!! What’s that? You can’t give out advice without seeing what I’m talking about? Okay. Not tiny, but all cross stitch and should stitch up relatively quickly. And Mary looks like a fun stitch with lots of bright colors. Can’t work on this one in the winter since my hands get so dry I’d shred the silks, but it IS springtime now. In my personal classification system, Betsy falls under the Large and Complicated heading. She is supposed to finish up at 13 by 15, and even though she’s on 25 count (which will likely feel like I’m working on burlap since I normally prefer higher count fabrics), she will undoubtedly take quite a while to stitch. No new stitches to learn, but there are lots of Queen stitches (which I like, but they're time consuming) plus sections that are freehand embroidery (why does that worry me so?). Not sure I want to do another Large and Complicated yet, but I’ve loved this sampler going on twenty-five years now…. When I start this, it will be with the knowledge that I will NOT be monogamous with this piece, even though I’m essentially a one-at-a-time stitcher. I’ve never done a full-coverage piece before and know I will need breaks. Perhaps a great many breaks. Um, yes. Apparently I *need* to have a sewing case in process. While this piece has been kitted for several years and has been in my easily-accessed, do-these-really-soon project bag for well over a year, now that I’ve finally finish-finished a sewing case, this one’s voice has gotten considerably louder. Perhaps it’s all those squirrels…. This should be a reasonably quick stitch, even over one. But this small project will require Thought prior to beginning. 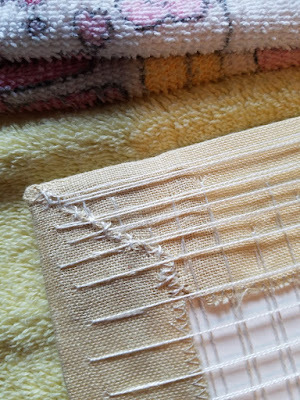 Many of the called-for colors are Classic Colorworks (Crescent Colours), and since my stash contains very few of those threads, substitutions will be necessary. Oh wait. Forgot about this one. If you blow up the picture, you can see that I wrote “completed 13 July ‘92” on the pattern. I really did stitch this guy. I know where I worked on him most often (on the bench by the caboose in downtown Vienna , Virginia, where we used to live, stitching and keeping one eye on the kids as they clambered all over old railroad car), and I specifically remember doing his beard and adding the stars once the regular stitching was done, but as I was undecided about how to finish the back, I never cut him out. Instead, I put him in a Safe Place. He’s in such a safe place that I’ve looked in every reasonable place and a number of unreasonable places with no sight of the guy. 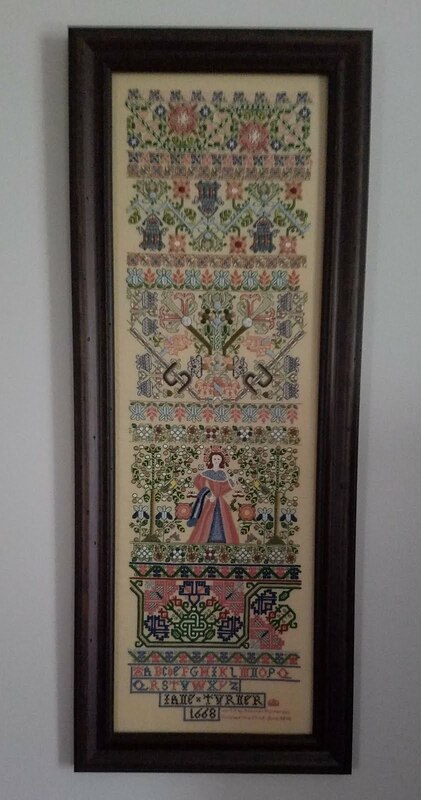 Actually, I feel pretty lucky that I found the pattern and picture and for several years they were in hiding also! 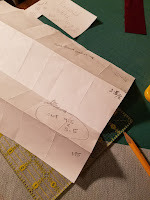 I do have some tan perforated paper in the stash, so I’d just need to match DMC colors to the picture – you can see that the colors have names only in the thread list. I have several other early kits in this series, but haven’t been able to bring myself to do any of the others until this first one is complete. Thanks for stopping by and listening to me ramble. Rachel at Ten Hour Stitcher (LINK) is our host for this compltely brilliant SAL. Thanks again, Rachel, for the much needed kick in the pants! This one requires a little history. 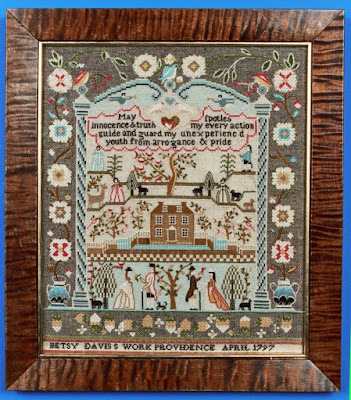 In 1995, I was able to attend the Spirit of Cross Stitch Festival in Valley Forge. It was the second time I’d gone to SOCS and this time I not only knew what my class projects looked like *before* class started, I was prepared for the awesome merchandise mall. By that I mean I was ready to look for charts and supplies for classes from a previous year that I’d fallen in love with. 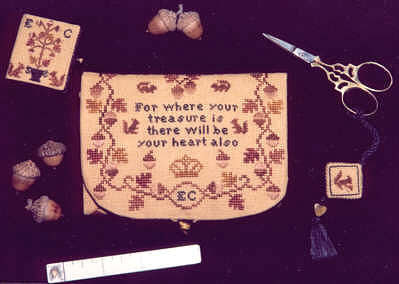 One of the charts I picked up was Merry Cox’s Sampler Sewing Case. After a minor debate with myself, I also bought the SOCS video class with Merry since the project was a similarly designed sewing case. 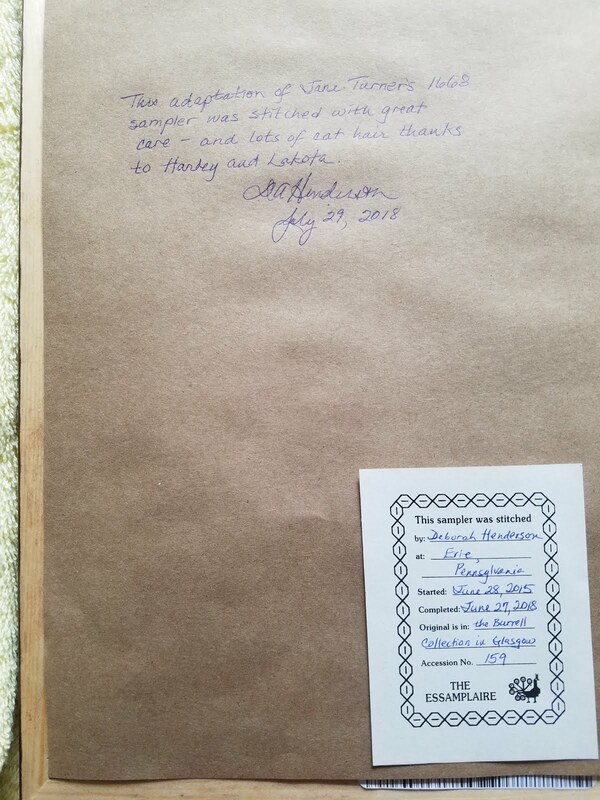 Understand that the intent behind purchasing the video was to get detailed finishing instruction for the other chart – I had no intention of stitching the case in the video. Of course at some point after finishing the first sewing case, I ended up contacting Merry in order to acquire her materials kit for the case in the video. 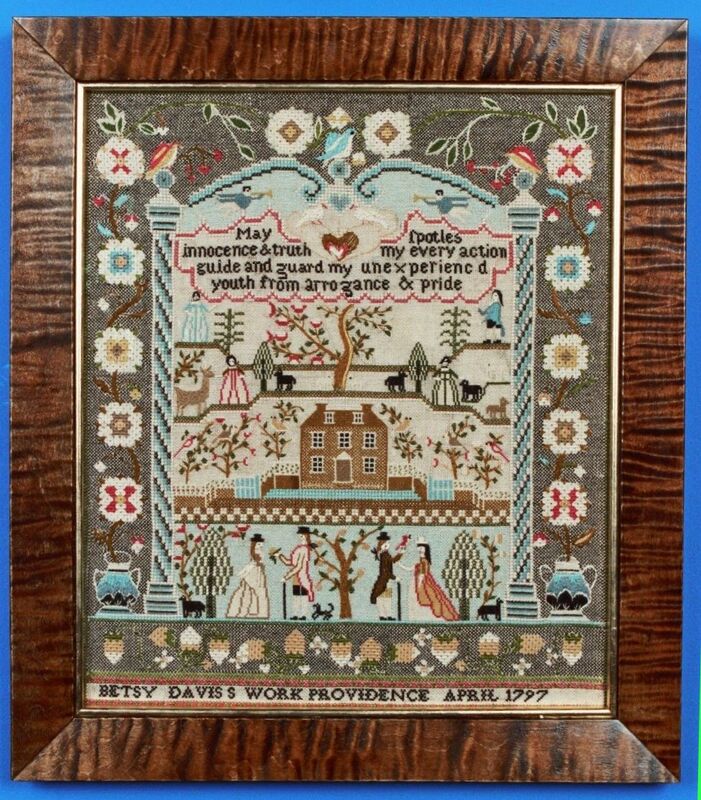 The original sampler case was stitched in 1997 and fully finished shortly thereafter. 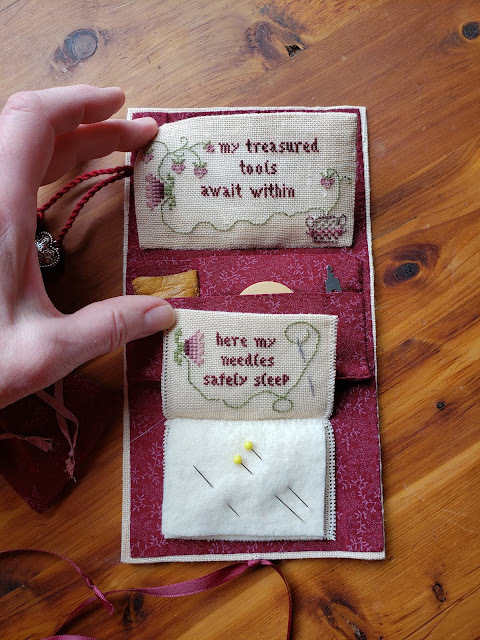 While working on the second sampler case, I decided I wanted it to be different from the first one – my chart has so many notes and ideas in the margins! 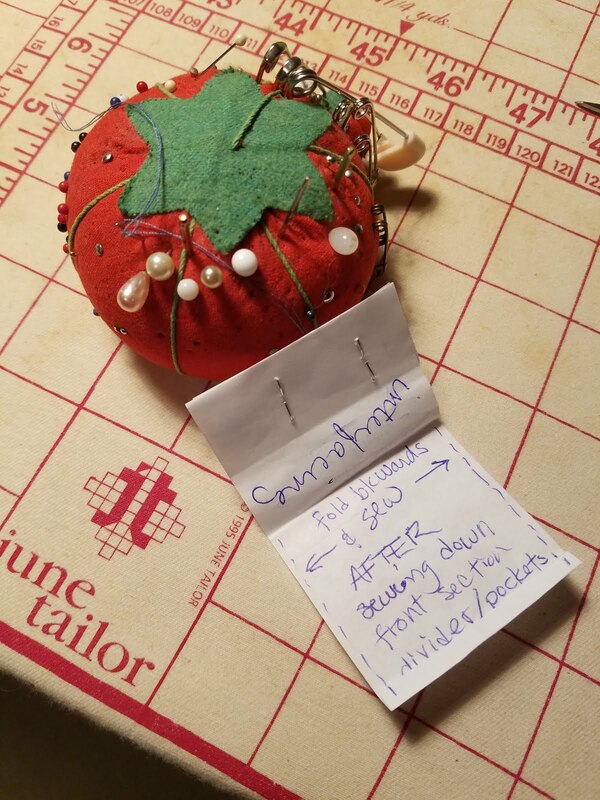 The plan was to turn Merry’s normal mattress pincushion into a pocket. And oh, while I’m at it, let’s make the needlebook a bit snazzier too. 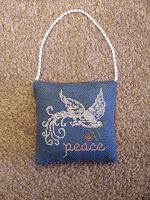 Stitching for this small was finished in (*cough*) 2003. 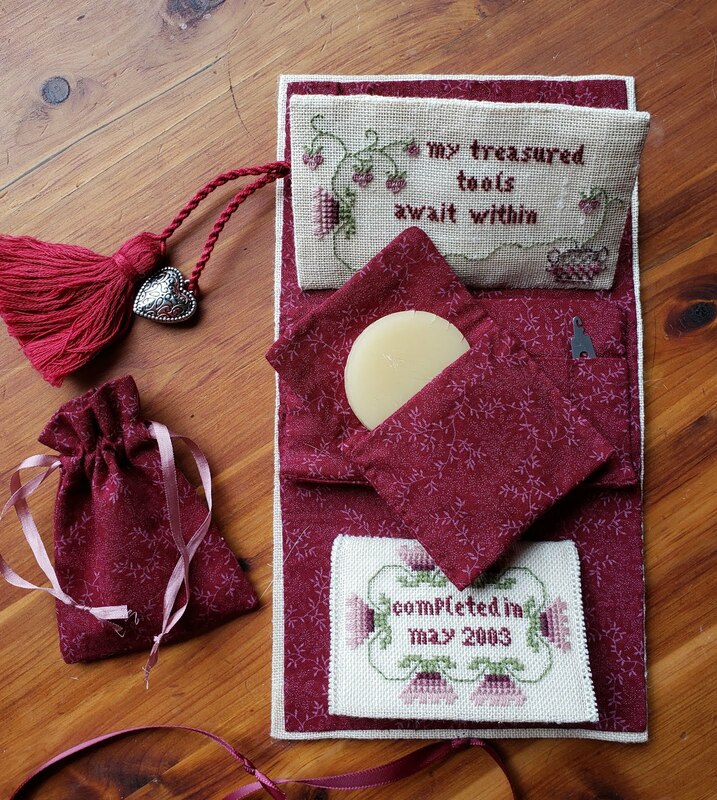 Ever since, it’s been rolled up and tucked carefully into my (Merry Cox SOCS class) Shaker Box with a number of my completed smalls, patiently waiting for me to go through my making-quilts frenzy and come back to stitching. 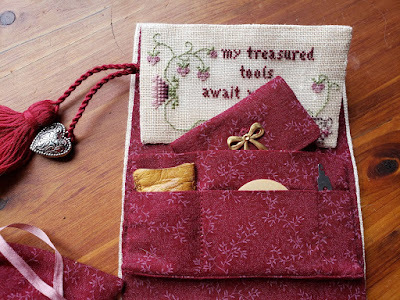 A few years ago I got a bug to finish the sewing case. For some reason, I’d thought it was larger than the first case. Nope. As charted, it's not even as big as the first one. So there was pondering as to how to enlarge it without losing the original feel of the project (and also without broad expanses of blank linen). 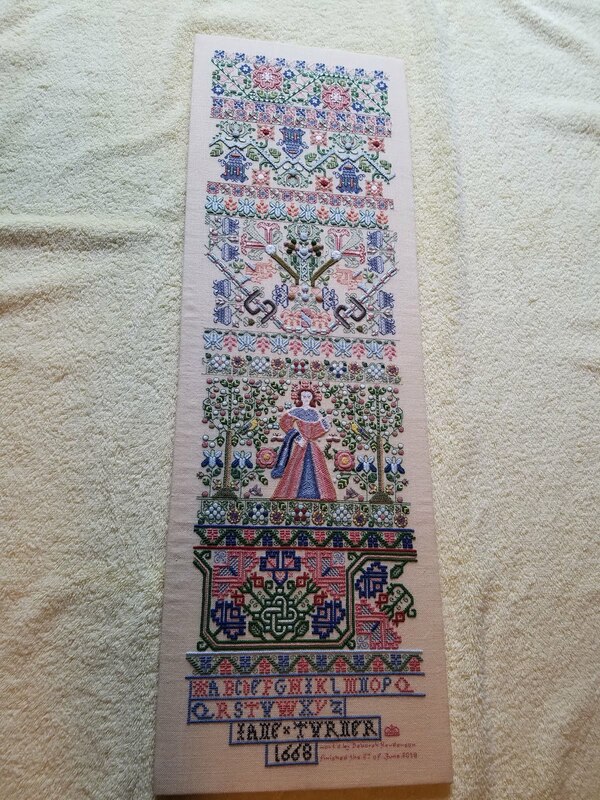 I trawled eBay to acquire more of one of the project threads, DMC flower thread (long gone from LNS inventories), then planned and stitched a border. Really, what had I been thinking? A tool-holding pouch with a flap closure in this itty-bitty case? Back into the Shaker box it went so it could … age a bit more. Enter Rachel’s SAL (*whoops and cheers and applause*), which got me seriously thinking about this project again. Preparing to work on the project required some serious advance planning steps, beginning with figuring a way to transfer the video file to my laptop which does not have an integral DVD drive. Hey, at least it was *on* a DVD rather than a now-useless VHS tape thanks to Wonderful Husband. 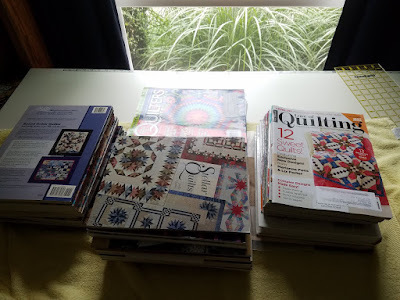 For the past few weekends I’ve disappeared into the back bedroom (where sewing machine, ironing board, and other essentials reside) for an hour or so a day. Yes, in addition to being a slow stitcher, I’m a slow finisher as well. Now when one is off the instructions map, one needs mock ups and templates to ensure plans and ideas work. Especially when one’s design is way too fancypants for one’s own good. That tiny bit of paper with staples is my pocket model and the other paper is my pattern. I even basted the pieces to the outer case this time! I changed the poem just a touch since I saw no reason to break words across two lines. On the inside bits, I stitched the letters over one so there would be room for more information ... and so I could put designs and words on the undersides of those flaps. I also added a strap to better secure my scissors - when Merry shows off her Sampler Sewing Case #1 in the video, you can see she made a scissor strap for that one, though I don't think it's called for in either pattern. 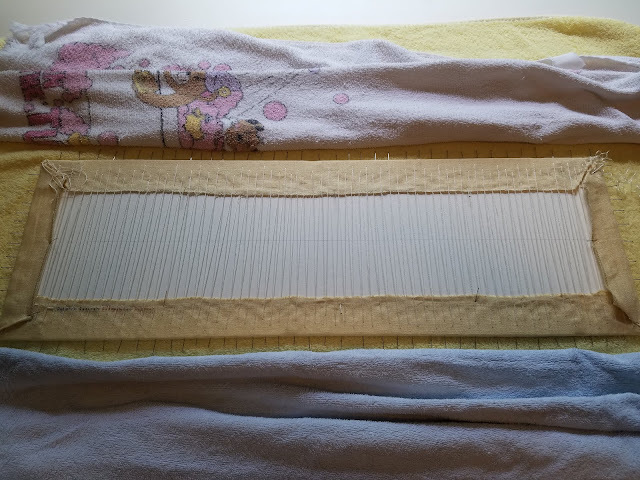 Rather than nun’s edged linen needlepages, I used felted wool to better protect my needles and pins from rust - our climate is more humid than I'd like. Here's that pesky double pocket that took so long to go from wisp of idea to reality. Even though I didn’t want to add all the bows that Merry used on her case, I thought the waxer pouch was a good place for the little bow charm. 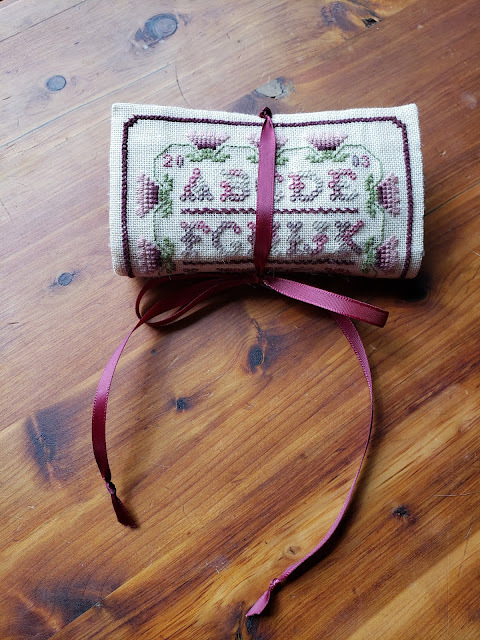 The drawstring on the other pouch is made from some of the silk ribbon provided to make those triple bows (see pics of Merry's case) – they were a bit too frou-frou for me. Happy dancing! Certainly it took me long enough to finish this piece, but I'm generally pleased with the result. Thanks for visiting with me today, and for allowing me to ramble. 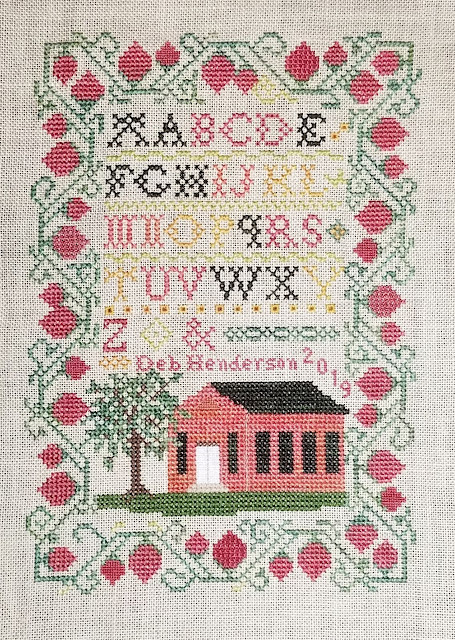 Finished sampler – happy dance! 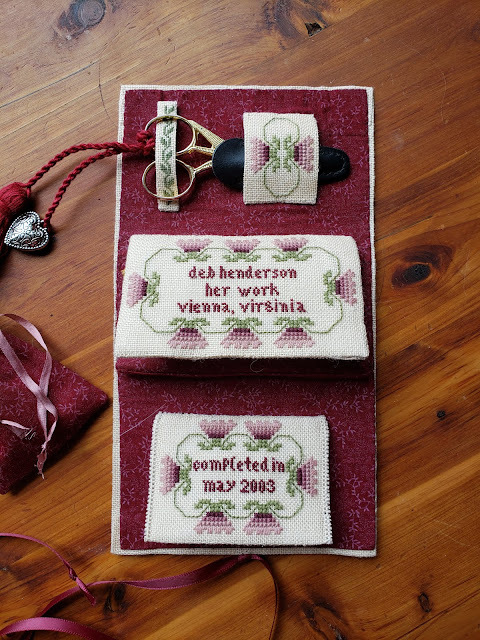 The Catherine Theron 1840 Town House Sampler is complete! 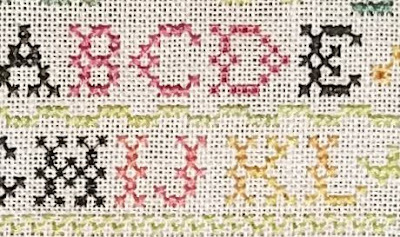 I started this to be a respite piece while working on Jane Turner, intending to finish a band on Jane, then do a section of this sampler (vine, strawberries, alphabet…), then work another band on Jane. But with nearly every band finish on Jane, I was excited to start the next band, so this little sampler lounged about unattended for quite a while. 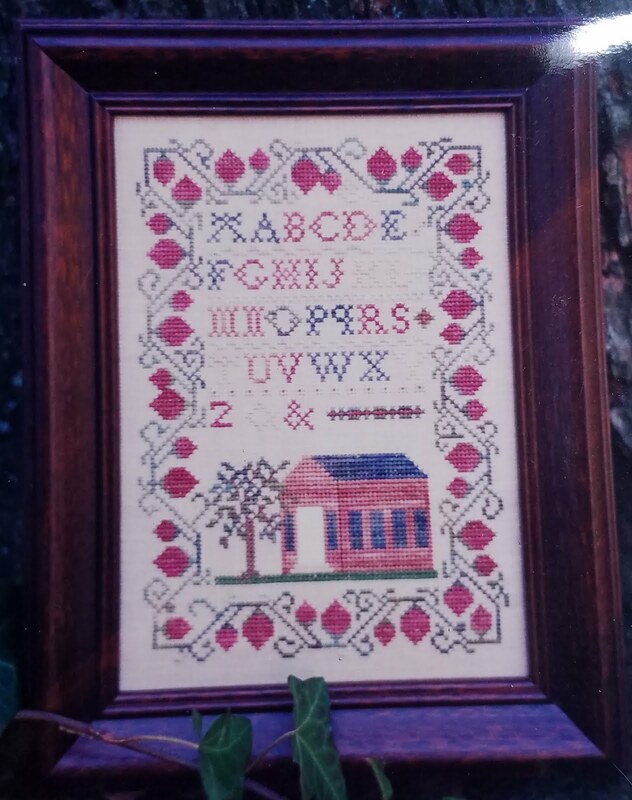 I picked up this kit at the Spirit of Cross Stitch Festival in 1992 - several years earlier I’d fallen in love with Catherine’s designs and with those nifty new overdyed flosses she made and used. 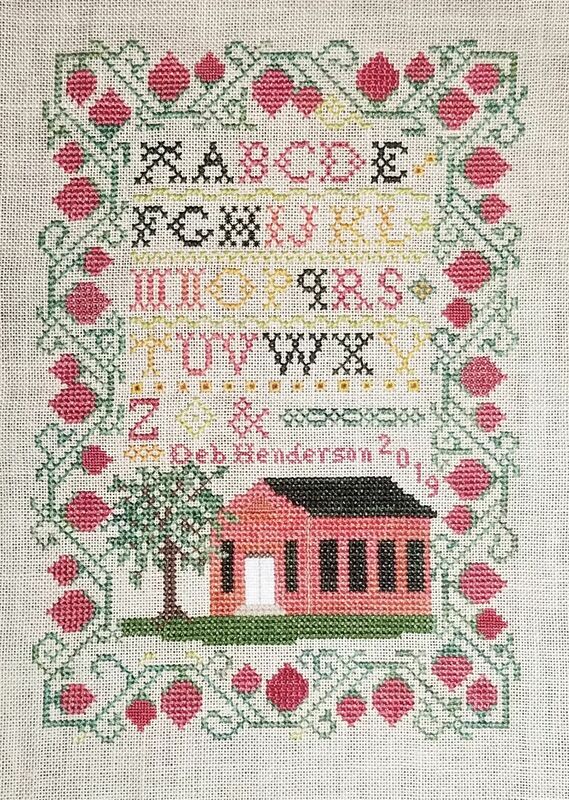 Being a child of suburbia, I always thought the name of the sampler a trifle odd – that sure doesn’t look like any townhouse I’ve ever seen! 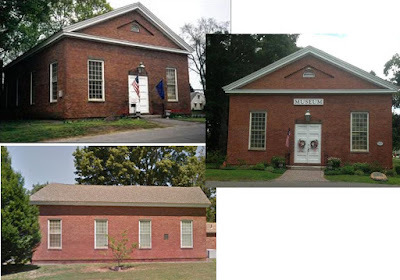 The building depicted is my rendition of the Historical Society’s building. This edifice is the original Glastonbury Town House built in 1840. Ah, it’s not a townhouse – a row house, as my father used to call them - it’s a Town House, a government building! (sigh) Curious at this point, I had to see what this building really looked like, especially since I’d always felt the door was a bit off. Hmmm… that’s lower, wider, and has a less steeply pitched roof. 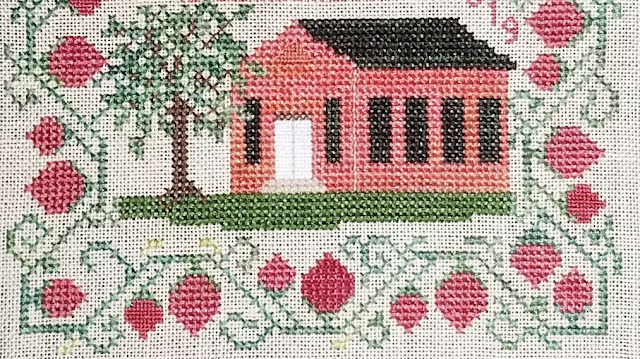 So the Town House on my sampler is *my* interpretation of the actual building. 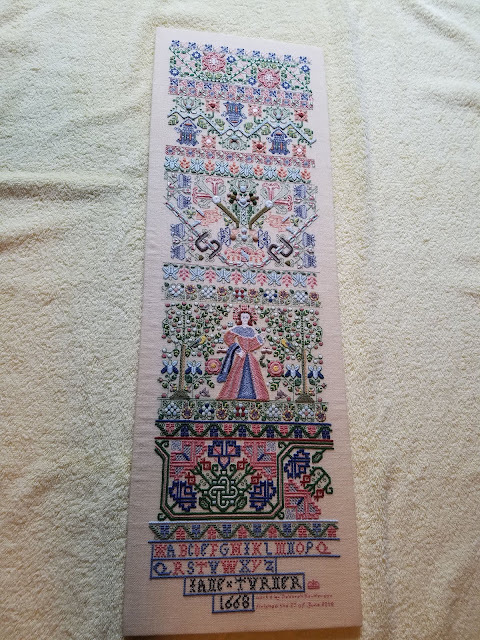 I made some other changes too - keep in mind I started this while working on Jane Turner, so even though the piece called for plain cross stitch with just a handful of Algerian eyelets, I had to add some more fancy stitches. 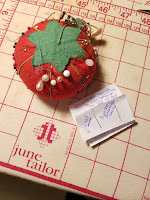 On each side of the border, one large strawberry is stitched in Smyrna cross and one small berry in tent stitch. Within the alphabet, I stitched my initials in eyelets (something I once saw recommended by Eileen Bennett). Which seemed a great idea until I realized that I’d stitched the “H” in the wrong color. 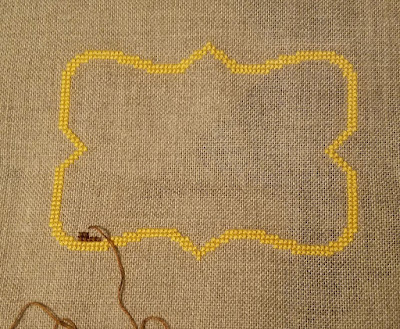 I discovered that frogging eyelets over two threads is very like frogging cross stitch over one, so the wrong color stayed. I added a gold overdyed thread (left over from stitching another Catherine Theron sampler), changed the filler motifs, and made the tree more densely leafed. Also added more grass. 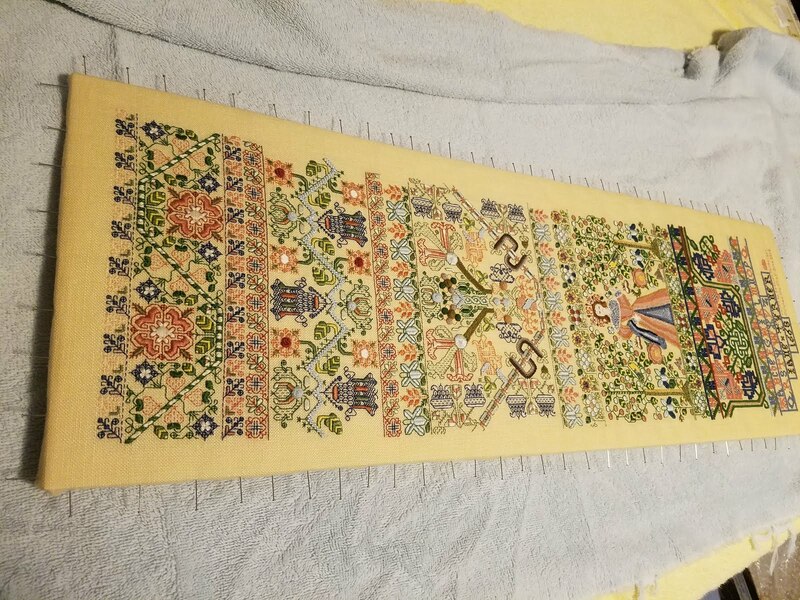 The last dividing band was to be all Algerian eyes, but I thought it would look neat to make a pattern of those and full eyelets. Not the best idea, probably. I tried to show the triangle of recessed brickwork above the doors. 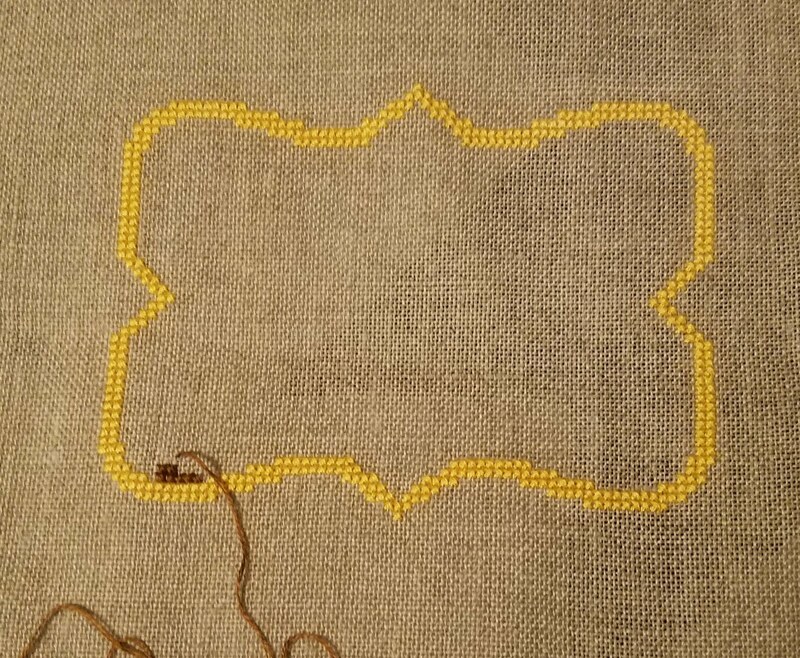 You can really only see the difference the tent stitches make when you’re right on top of the sampler, but I’m still pleased with it. You can see some of those random berry changes here. This is a small sampler - stitched area is less than six inches by about eight and a half. How can it be TUSAL day already? I was thinking there was another week to go and nearly missed it! The Silly Stitching Calendar says that I’ve had 15 stitching days since the last TUSAL check in, and I have two piles of orts to show off. 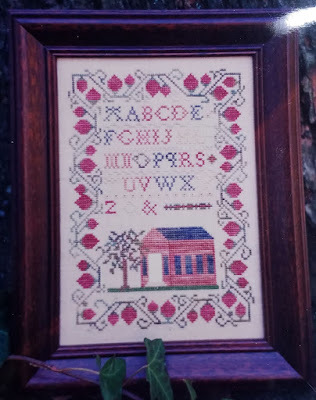 I’ve finished Catherine Theron’s 1840 Town House Sampler, but have plenty to say about it and think it deserves its own post - hopefully in a day or two. The larger batch of orts belongs to that sampler. 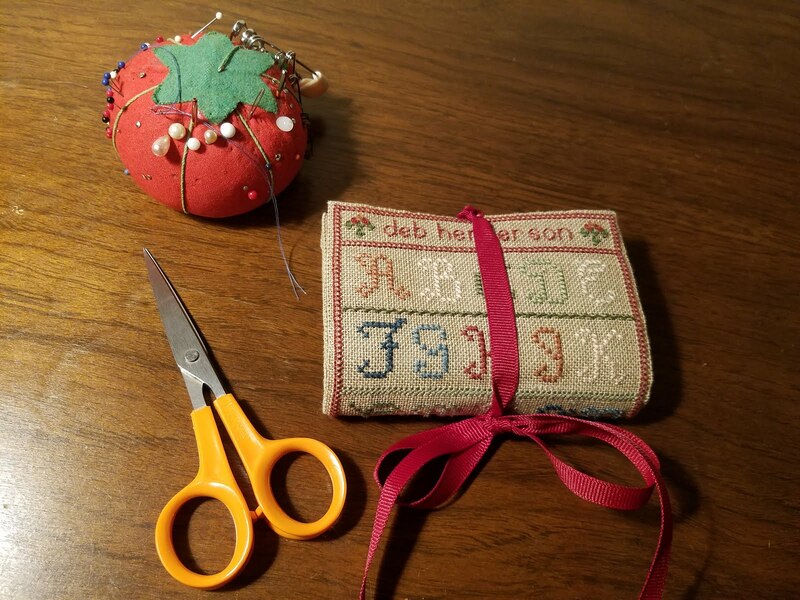 The tiny bunch of orts (I don’t think qualifies as a pile, really) is from Season’s Greetings, a Little House Needleworks ornament that’s been sitting neglected for maybe a year. The other night I finished the frame and had worked one section of the branch, delighted with how quickly it was going ... and then realized it was in the wrong place (hello, frog). This should finish up quickly, but I really want to figure out what larger piece to work on next before it's done. Happy stitching everyone – thanks for stopping by! Since you asked about the lacing for Jane Turner, I wanted to share the resources I found when getting ready to work. Well, whatever I asked my good friend Google to find when I first looked, I was completely unable to replicate it. 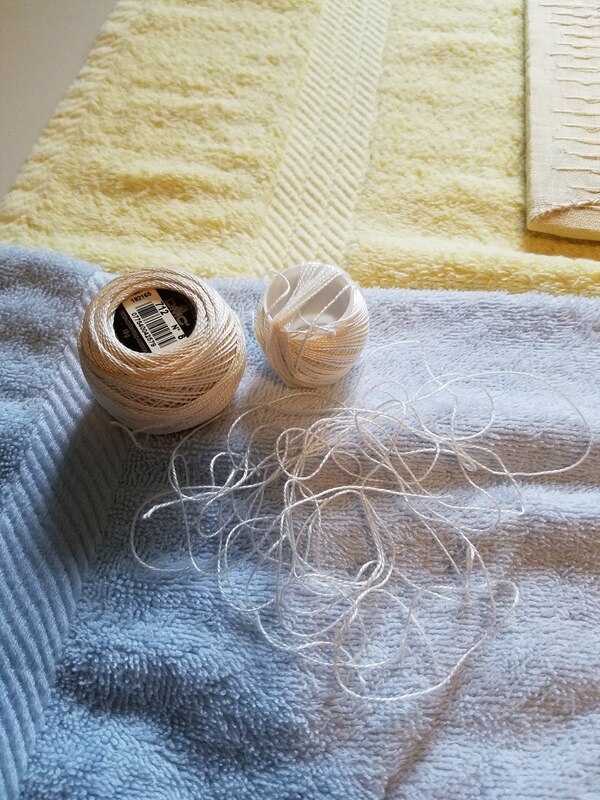 When preparing to lace Lady Jane, I read a number of online answers to “what kind of thread should I use?” and the most repeated answer was perle cotton. THIS LINK *might* be one of the sites I found before – at least the post mentions (perhaps just implies?) using a single strand to do the side-to-side lacing and a second single strand for top-to-bottom. 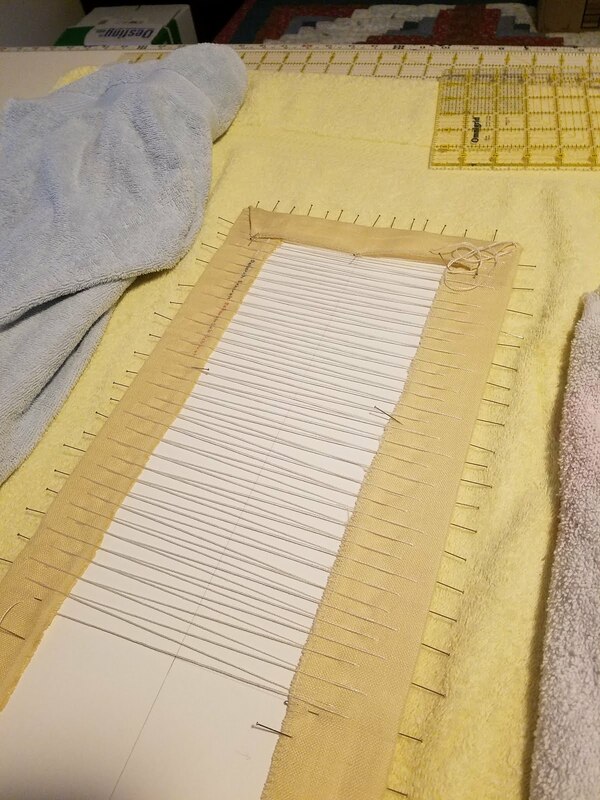 Anyway, other than securing the corners, YES - Jane is laced to her mounting board (acid-free foam core) with just TWO lengths of perle cotton. 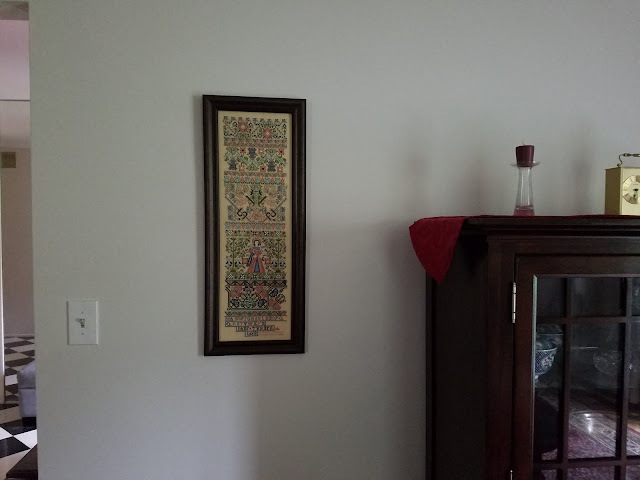 While I've laced all the cross stitch pieces I've framed, I had not tried this single-strand method before. Noah is in a 16 by 20 frame (I think), and that's laced using dental floss with a fair number of starts and stops - probably ten to twelve of floss each time. Anyway, back to Jane. Starting in the center of the longer dimension is what I normally do. Pull a yard or two of perle cotton from the ball and thread your needle onto the end. Do not cut the perle cotton and do not anchor it into your fabric. 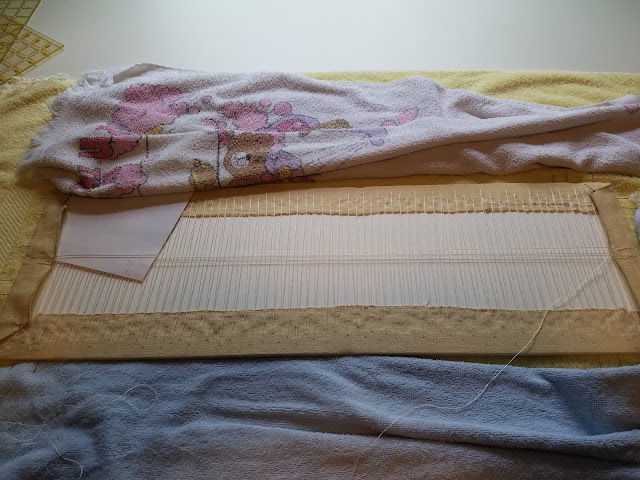 Go back and forth (er … side to side) several times – three or four stitches – and then very gentle pull more thread through each stitch you’ve taken so that you again have a length of thread to work with. Take three or four more stitches and again work the thread through all the stitches you’ve made. After you’ve used up what you’ve pulled loose from the ball of perle cotton, unwind several more lengths. Yes, this is EXTREMELY tedious!! 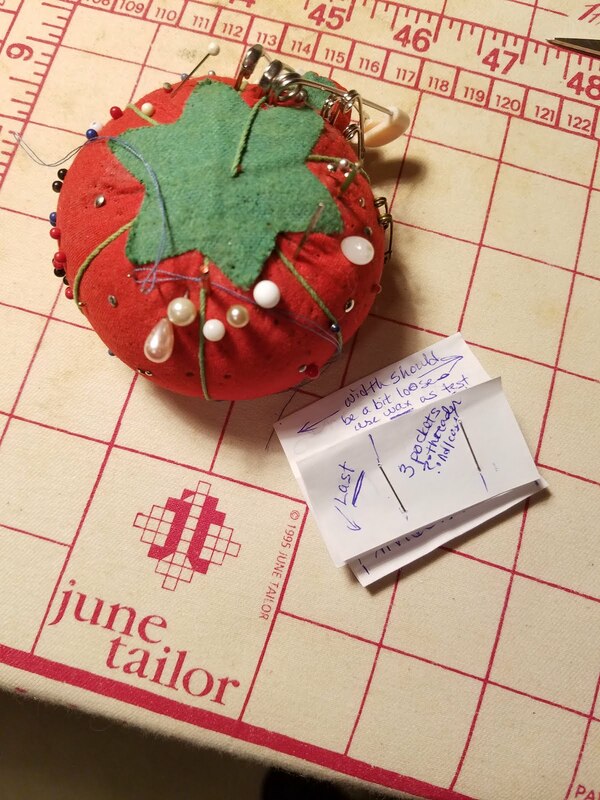 When working on Jane, I would do three or four “pulls” at a time from the ball of perle cotton, and then work that through all stitches taken till I got to the place where the needle was. To be more specific about what I mean by a pull, I would hold the perle cotton ball down on the work surface with one hand and pull a length out with the other hand until my arm was fully extended. So for me, a pull is a bit more than one yard. Oh yeah, since you start in the middle of the side, it’s a really good idea to try to keep count of the “pulls” you take from the ball. 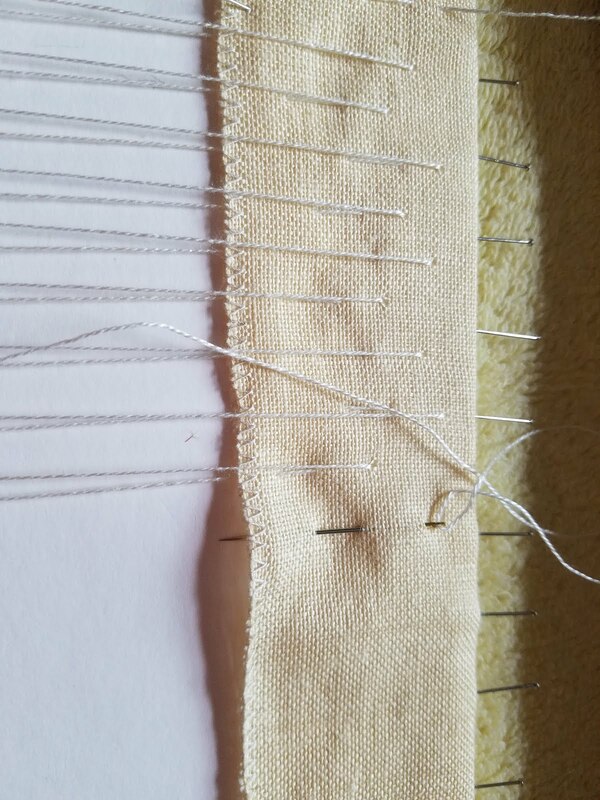 Once you get to the end you’ve been working toward, make sure you have a foot or two extra thread at the end, then remove your needle from the thread. Now comes the really fun part. 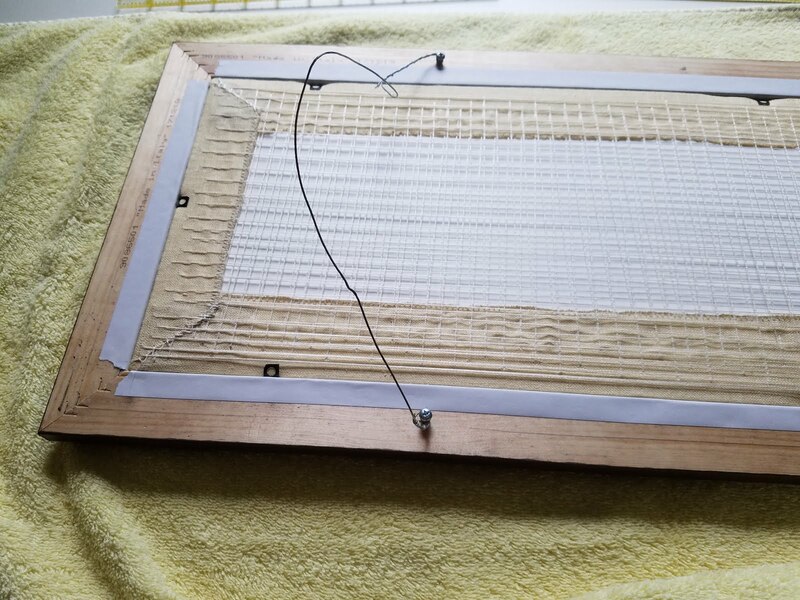 Since you’ve been keeping count of the number of pulls you’ve taken from the ball of perle cotton, you know how much thread to pull off the ball to lace the other half of your piece of needlework. This will likely convince you that I am completely nuts: make the same number of pulls from the ball of perle cotton as you used to lace up half of the side of your stitched piece, being very careful about how you lay this down on whatever you’re using for a work surface – you really don’t want this to get tangled up. 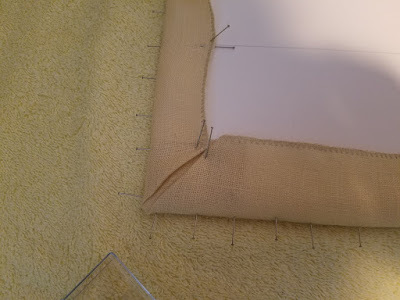 Add a few more pulls as a safety margin, then cut the thread and thread your needle. At this point, you go back to taking three or four stitches from side to side and then working your thread through. Since there was an enormous, piled-up bunch of thread, I’m pretty sure I did three or four stitches, worked just a couple of yards of thread through, then took three or four more stitches. 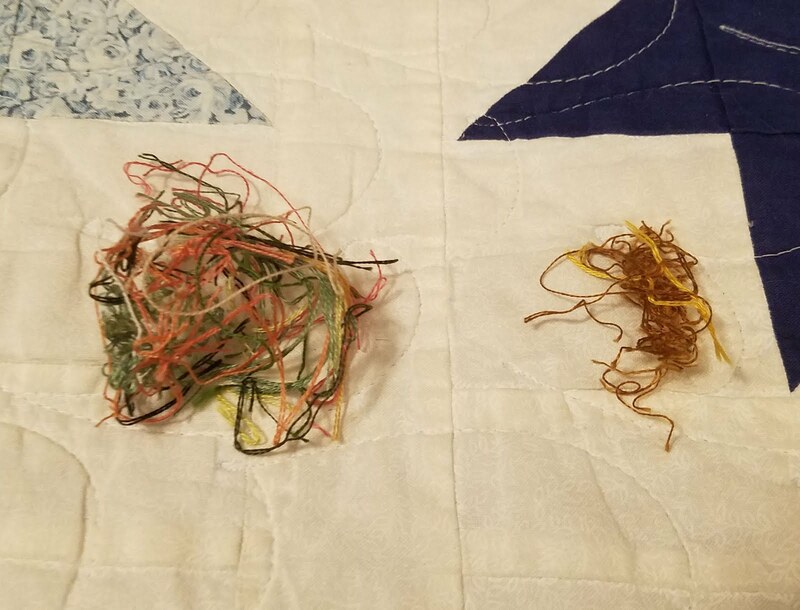 The huge pile of thread tangled up twice and I very carefully picked out the knots both times – with this much effort invested, I was determined it would be a single length of thread! I probably should have started out by saying the pins holding Jane to the mounting board remain in place while lacing. I kept a towel folded over the pins as much as possible so as not to snag the thread. 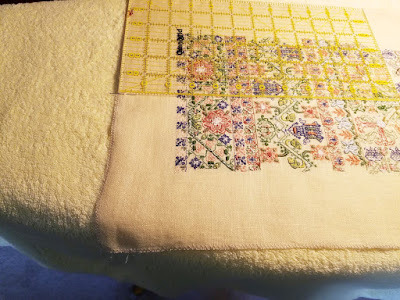 After reaching the other end and finally cutting that thread, it’s a good idea to turn your needlework over to make sure it looks the way you want it to. If it’s not perfect, you can still make small adjustments at this point by removing pins and scooching the ground fabric one way or the other, then repining. When it’s just right, it’s time to tighten up the lacing, once again starting in the center and working to each end. When the entire side was snug, I anchored the thread. I followed the same process to do the lacing top to bottom. 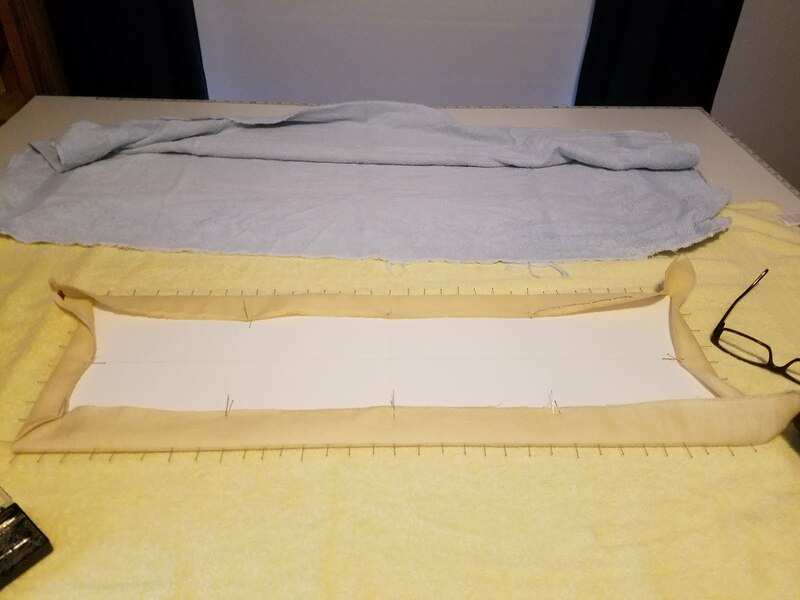 Various online references I found said mitering the corners is not necessary, but I’ve always done that, so Jane’s corners are mitered and stitched down. 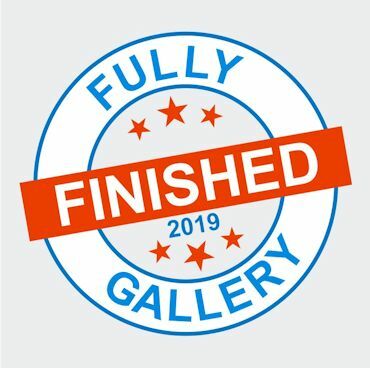 This was undoubtedly way more detail than anyone was looking for… If you’ve made it to the end, thanks for staying with me! As you can see, Jane Turner is now proudly hanging on the wall. She’s in the living room, just beside the room’s entrance. Not where I had envisioned her, but Wonderful Husband pointed out that in my chosen location, rather than catching my eye each time I walked by, she would be shadowed and invisible for a good portion of the year. Sigh. I did mount her myself, probably more from paranoia than any other reason – I couldn’t even think about handing her over to anyone else without getting queasy! 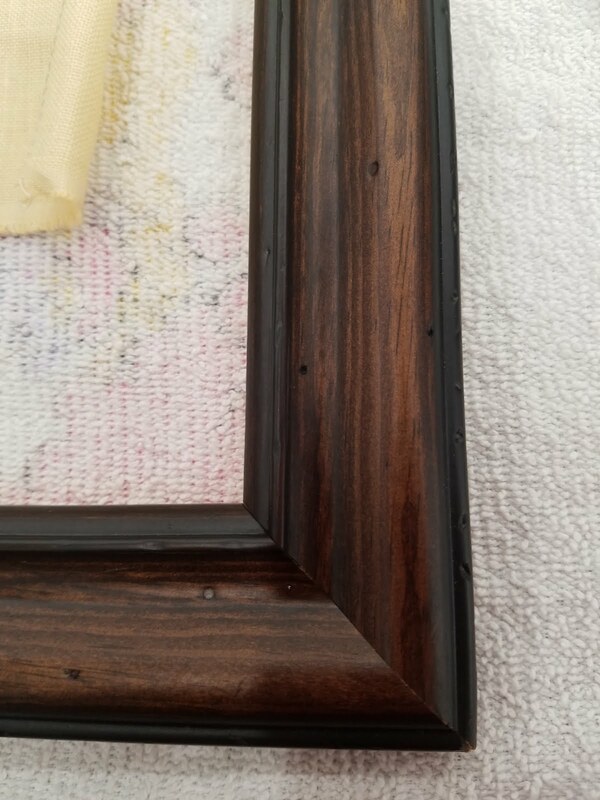 Here’s the frame I picked. 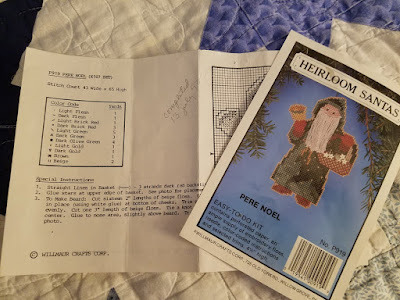 I used to use unflavored dental floss to mount needlework, but thought I’d see what was recommended and after some internet research, decided on using perle cotton. 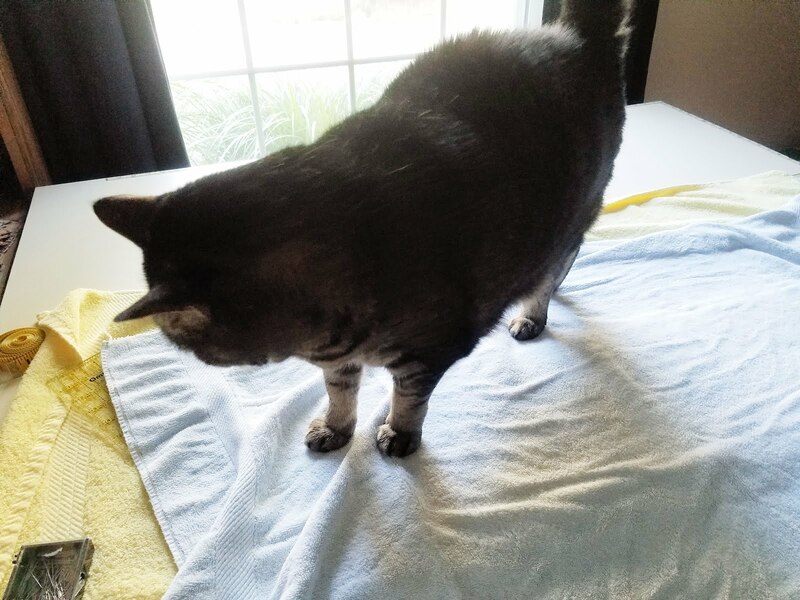 After getting my work space prepared, I did the requisite blocking and measuring. … and repinning after turning things front side up. Of course Harley wanted to help. Giving in to my overachiever side, I decided that the "recommended" single looooooooooong strand of perle cotton lacing left-to-right and another single stand top-to-bottom was the best way to handle mounting Jane. Have I mentioned that Jane's 24 inches tall? 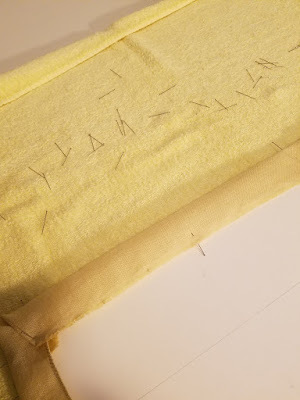 I don’t know how a professional laces needlework onto a backing board, but I figured that over time, in-out-in-out would be a lot better for Jane than a single stitch passing through the linen, since this would put much less stress on specific spots in the fabric. Starting in the middle allowed me to estimate the length needed for the other half - I tried to keep count of how many "pulls" I took. And it worked ... pretty much, anyway. I’m pleased with how little of the perle cotton was wasted. It took nearly an entire ball to do the job. The full ball below is for comparison so you can see how much was used, and the loose snippets are the bits that were cut off. Of course the corners are miter-folded. After a couple of hours (oh, my tired back! ), she’s ready for the frame! Wonderful Husband helped by drilling tiny holes for the small screws used to mount the hanging wire. Do you get the Scarlet Letter’s newsletter? If not, this may seem a bit odd. 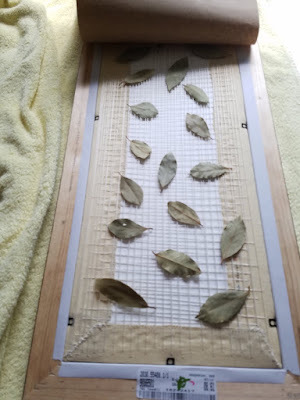 When the Grace Kemish sampler was from her frame, Marsha discovered that dozens of bay leaves were inside the backing/dust cover. The stitcher must have known they are a natural bug repellent. Cool, huh? Adding some seemed like the right thing to do (hey, it worked for Grace for 200 years! ), and we have a *big* container of bay leaves, so I figured, why not? I filled out and used the little tag supplied by The Essamplaire, and added a brief note of my own, then glued the dust cover to the back of the frame and weighted it. I may not be making quilts any more, but I know how to put my book and magazine collection to good use! And here she is in all her framed glory! 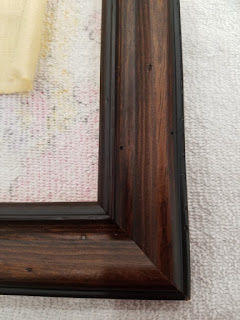 Would you believe after all the care taken in getting the stitching mounted properly on the foam core, all the pinning and repinning and checkingcheckingchecking, I didn’t turn the frame over before putting on the backing paper?? Argh. Yes, I think she is the tiniest bit crooked in the frame. I will remedy this at some point, but don’t have the heart to do so right now. Thanks to Rachel at Ten Hour Stitcher, I’m hoping to Fully Finish several things I’ve had stitched for … a while. 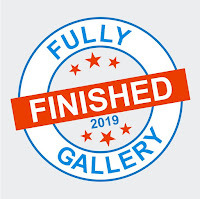 So far, so good – today is the first link up/posting day and I have something to share – woohoo! Though far from the oldest item in the unfinished ornament pile, I’ve wanted this little guy for my tree since 2003 when I stitched him up for an ornament exchange. The chart was a freebie though I’m not sure if it can still be found – it has a 2001 copyright by K. Elaine Kramer Designs in case anyone is wants to go looking. 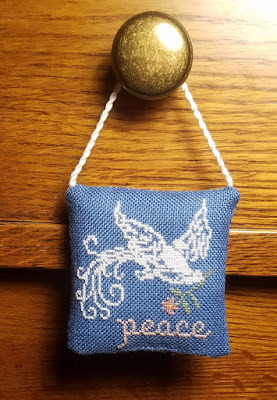 I finally got around to stitching one for myself in 2016, starting August 5 and finishing the 28th (this was a “take a quick break from Jane Turner” piece). 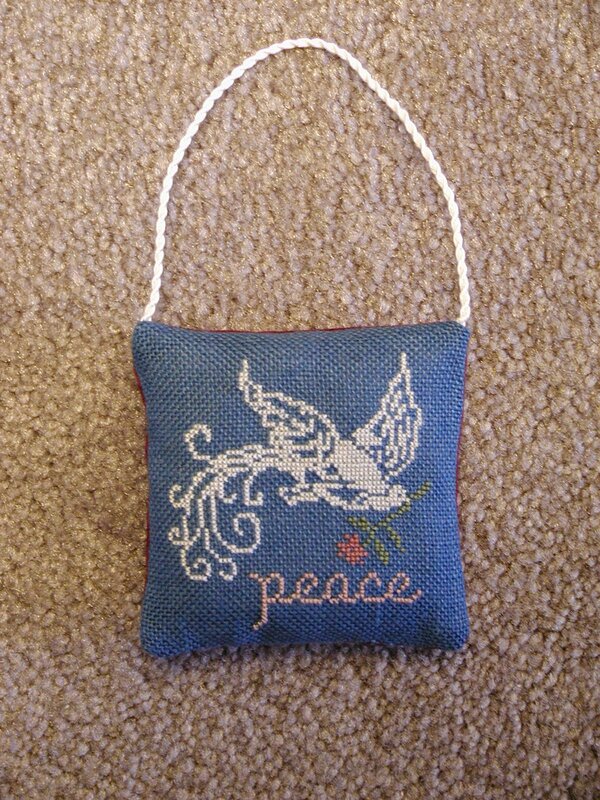 As with the “original,” this is stitched on 30 or 32 count blue something, one over one. Both times I wanted to make his tail sparkly but couldn’t manage either time because not one fiber I tried matched the image in my head. Here’s my very own Peace Dove, who will grace my Christmas tree come December. And if anyone’s curious as to how the first one looked, they were very similar – here’s the give away one.